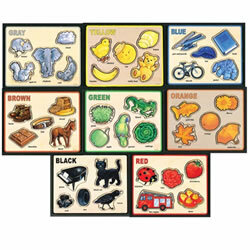 Kaplan offers a number of puzzle sets for the classroom. 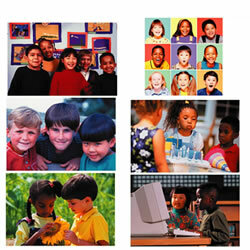 Subjects include the alphabet, numbers, diversity, special needs, shapes, food, life skills, animals, and more. 3 years & up. Dive into these delicious, vivid, real-image cultural food puzzles. 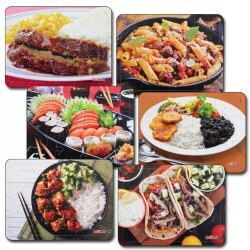 Six various dishes are represented on each of these 12-piece puzzles. 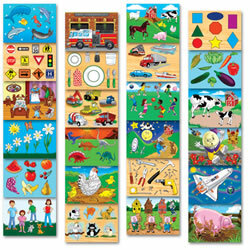 Puzzles measure 9"H x 12"W. Made in the USA. 2 years & up. 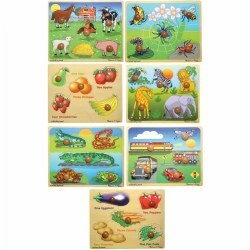 This set of 6 high quality wooden peg puzzles can help children learn differences in cultures and beliefs. 9" x 12". 3 years & up. 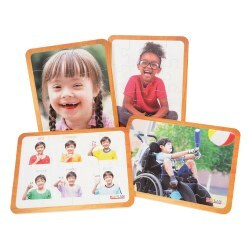 Each of the four puzzles in this set shows real images of children of differing abilities. Features include a tabbed corner for easy piece removal and photo underneath for guided assembly. Puzzles each have 14 pieces and measure 9" x 12". 6 years & up. 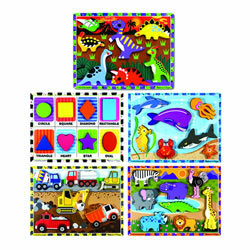 Children will be amazed by the beauty and variety of animals and sea creatures in the Rain Forest and Under the Sea puzzles. Each puzzle is over 4' tall and has 100 pieces. PreK & up. 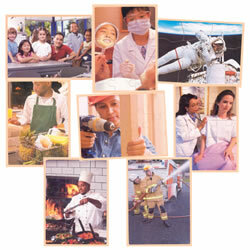 These glossy photograph puzzles illustrate diversity, raise multicultural and environmental awareness. Depicted scenes are multicultural and anti-bias and show locations from around the world. 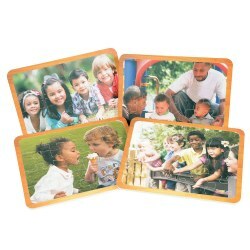 Each 9" x 12" puzzle has 12-16 pieces to accommodate children's skill levels. 3 years & up. 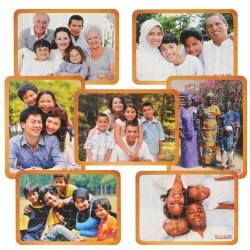 Each of the four puzzles in this set show a real image of a diverse group of friends or family. 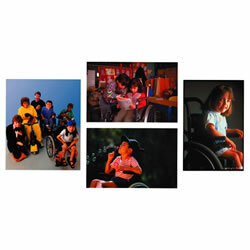 Features include a tabbed corner for easy piece removal and photo underneath pieces for guided assembly. 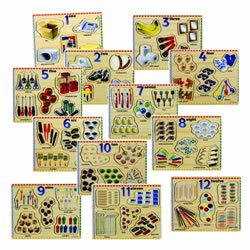 Puzzles each have 14 pieces and measure 9" x 12". 2 years & up. 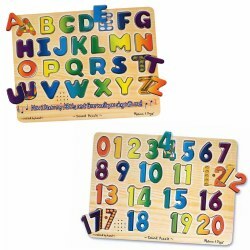 This set of 4 high quality wooden peg puzzles help children learn about people with differing abilities. 9" x 12". 3 years & up. 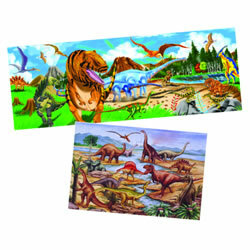 Two large dinosaur floor puzzles will keep your students interested in this subject for a long time to come. 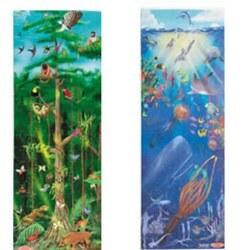 The Land of the Dinosaurs is 4' long and has 49 pieces and the Dinosaur scene measures 36"W x 24"H and has 24 pieces. 12 months & up. Extra large knobs make it easy for small hands to remove each brightly colored piece. Matching full color pictures are underneath. 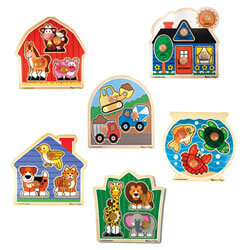 These super sized, solid wood puzzles with extra chunky 1/2" thick pieces are the perfect first puzzles. 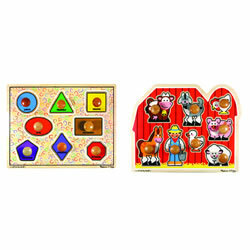 Set of 2 puzzles including farms and shapes. 3 years & up. 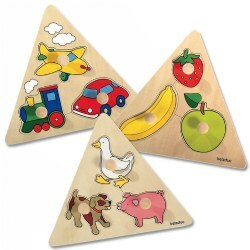 The whimsical patterns under each puzzle piece and light activated sensors that trigger songs and sounds are an engaging way to reinforce early learning concepts. Each puzzle requires 3 AAA batteries each (not included). 6 years & up. 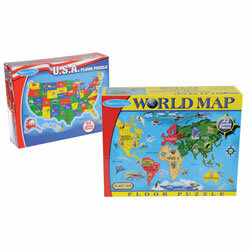 Discover the world and the United States with these floor puzzles. Helps children understand where they live in relationship to the size of their state and the world. Great for introducing Social Studies. World puzzle has 33 pieces and USA puzzle has 51 pieces. Each puzzle measures 24" x 36". 3 - 6 years. 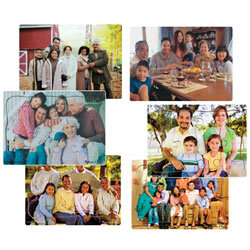 Learn about families from different parts of the world with this set of 7 photo puzzles. 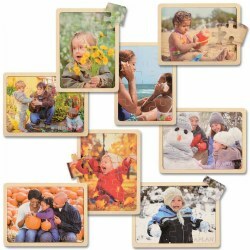 Pictures are printed under each puzzle piece for ease in matching. 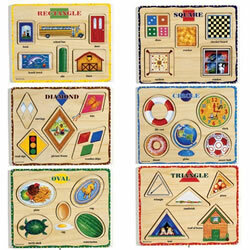 Each 9" x 12" puzzle has 12 pieces. 3 years & up. 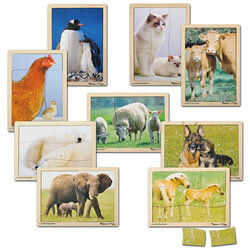 Beautifully photographed, this set of 9 puzzles includes familiar animal mothers with their babies from the farm, wilderness and home. 9" x 12" with 7 to 9 pieces.